This July 24th marked the date of the Rochester 600k. This ride was a huge thing for me. 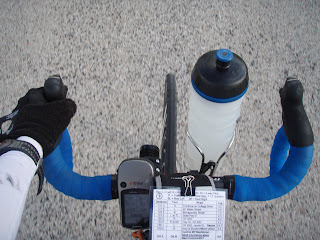 Last year, it was my second brevet ever and, at that time, I rode it nearly solo in 38 hours and 40 minutes. During that 38 hours, I nearly passed out from an electrolyte imbalance, created a major problem with tendinitis in my left knee and finished hacking some kind of unidentified, solid stuff out of my lungs: it was really great but I always left feeling like the ride beat me. This year was payback time! Completing this ride well was a big deal. I had also stopped at the overnight (210 miles) for 4 hours in which I never really slept and I had always wondered if I would have avoided problems by just riding through the night and taking a cemetery nap. In reading many sources, it's recommended to do a sleepless 600k because it is much harder than taking a traditional break and prepares you better for the completely obscene fatigue that is part of a 1200k. Having now done it both ways, I have to agree with everything said. 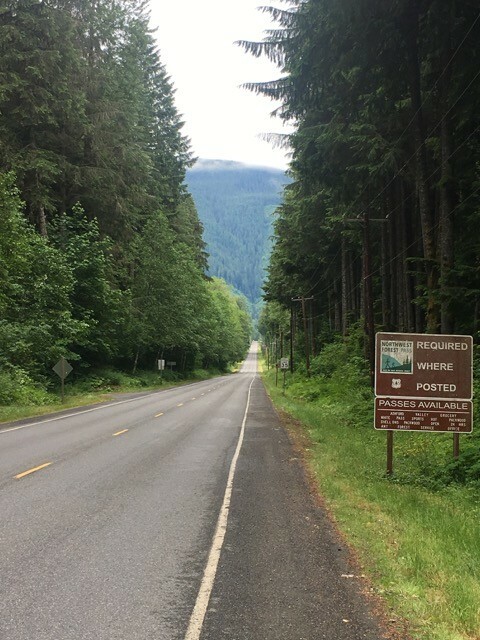 Finally, this ride went from important to near must-complete status after failing to complete all 1000k in the Cascades. I still had a major injury and with 21,000 feet of climbing, this 600k has as much climbing as the Cascades. I had not, and still have not, fully healed; that will take many months. So no sprints, no sudden jarring, no heavy duty pedal mashing. Failure to heed such rules might mean permanent damage. The rule is that if the hamstring starts to hurt, the ride is immediately over. The ride starts at the Walmart parking lot in northern Rochester, Minnesota. It's 6:00 am and I am there with Paul, who rode in my fleche team earlier in the year. It turns out that his wife really likes him to ride with people as much as Kathy likes me to ride with people. Must be a spouse thing. 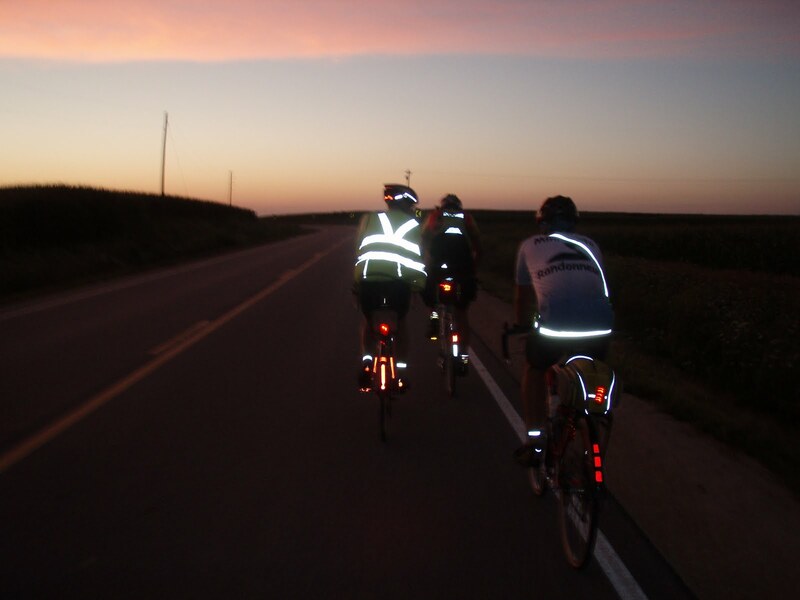 We had a tacit agreement to ride through the night as long as nothing horrible was going on at the overnight. I did insist on stopping for long enough to rinse the outer layer of salt and grim off and change clothes. 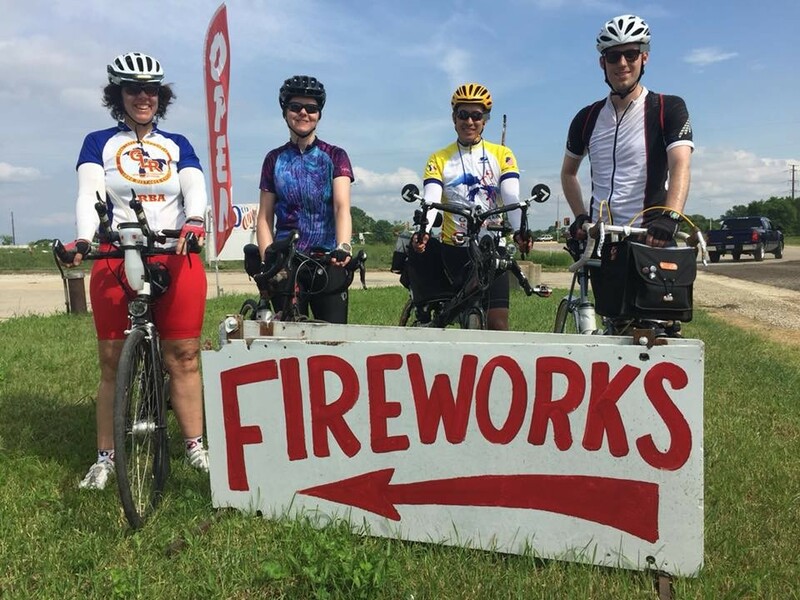 The forecast had been everything from a massive heat wave to thunderstorms to glorious during the 10 days before the ride. Turns out, the ride started after the thunderstorms had moved through. We didn't even have that much wet pavement. At the start were 12 people including Kenny from Chicago (who I remembered from last year), Ralph from Missouri, Bob from Madison, Paul and myself. Also present were Martin, who may be the fastest long distance rider I have ever seen, and Mike the RBA. Martin is a rider that I see 3 times on this brevet. First, I see him at the start. Second, I see him as he passes me on the way to back to the overnight. Third, I see him as he passes me again on the way into the finish after I have ridden all night long and he has had a full 8 hours sleep, probably seen a movie and had a 5 course meal. The guy is amazing. It's always a bit of a race to see how far I can get before he passes me for the third time. We leave right on time and immediately, the group splits into 2 groups, the fast guys and the scenic pacers. The weather is still quite grey as we head down US 22. It's gently rolling and the pavement is good. It is, however, very humid from the previous night's rain and my rear view mirror actually fogs up. Paul, myself, Kenny, Ralph, and Bob all introduce ourselves since we will all be more or less keeping each other company for many miles. What a difference from last year when there was only me. This picks up my spirits enormously, I won't be listening to my IPod continuously for 30 hours. We roll through Stewartville, still no sun. But everything is incredibly green. This summer, we've had so much rain that the normal fried look is nowhere to be found. Even the cows look relaxed. By the first control at Chatfield, I am ready to refill my bottles. I'd been noticing a little strain on my hamstring, so I pulled off my shoe to put another plastic shim under the cleat. To my horror, 2 of 4 screws are missing! Fortunately, I have one extra so at least I can ride with 3 instead of 2. Ralph loans me a screwdriver since my new cleats (I just switched to Speedplay) use phillips and it turns out my multi tool doesn't have one. I decide to really torque down the rest of the screws just to be sure. This winds up being an error (Speedplay pedals don't work that way). It puts a bit more stress on the knees since the float is comprimsed by the torqued down screws. I grab bananas, drink some V8 and chocolate milk and off we go. The weather continues to be gray with temperatures now in the low 70s. Perfect weather, at least for me; there are some more threatening clouds to the north, but none to the south (which is happily where we are going). I spend time chatting with Bob, who crewed last year's 1000k. 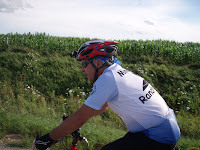 I always say that the best part about randonneuring is the people you meet: Bob is one of those super nice types. His girlfriend, Melissa, is driving support for the ride. How cool is that? The first inkling of how bad the previous night's storms were is evident going down the hill into Rushford. There are blasted bits of tree everywhere and when we get to the control, it's closed. It turns out the power has been out for hours and virtually nothing is open in town. Fortunately, Pam's Convenience Mart is open. Still no power, but Pam has a calculator and is taking cash and signing brevet cards. We buy supplies and I realize that I left my patellar tendon strap back in Rochester. I quickly make a temporary replacement with a bungee cord and an arm warmer. The climb out of Rushford is a very long one. Basically 6-8% with occasional spikes into 9-10. It's about 3-4 miles long. Since this is the first major climb of the day, I fall back quickly wanting to protect my hamstring. I climb at my own pace which is slightly faster than Kenny. Bob, Paul, and Ralph go on. This stretch, Rushford to Harmony, is possibly my least favorite stretch of road ever. Most of it is just fine. But it is long and uninteresting and full of rollers. It also has a 4 mile stretch at the end of some of the worst pavement ever laid down by MnDOT. I also find myself fighting a substantial northwest wind that up until now had been a friend. I don't catch Bob, Paul, and Ralph until the Harmony control. Kenny rolls in about 3 minutes after I do. At this point, we are quite near 100 miles and it's just past noon. I am certain to eat well here: sandwich, V8, cookies, chocolate milk, bananas. I take food for to road too. 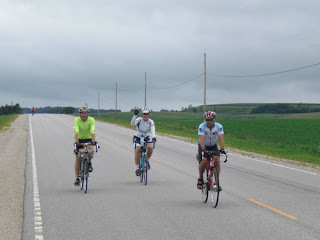 The next 40 miles to Decorah, Iowa are mixed. Outside Harmony is the only stretch of the entire ride that you can argue is kind of flat (the rollers are pretty benign). Turning onto Pole Line Road, the rollers return to full strength and then descend into a river valley near the town. Red wing blackbirds usually dive bomb cyclists here, but I fall back into conversation with Bob and don't really see any. By this time, the clouds have rolled out and the sun appears. The wind is, once again, a friend and we fairly fly into Decorah. It's at this point that we realize that our average moving speed is over 15 mph, quite fast for those riding in our little group. We roll into the control at about 2:45: a sub-9 hour 200k. At this point, the temperature goes up into the 80s. Decorah is a nice town. This weekend turns out to be the town festival so the main street (our route) is blocked off and filled with food stands, music and other entertainment. We get yelled at for riding in the festival. However, it doesn't really sink in fast enough to do anything so we decide to just finish getting through town and not do it again. We ride through anyways, at this point, I am searching for a pharmacy to attempt to get a real patellar tendinitis strap. Finally, I spot it on the corner. Racing in, I ask and they have an entire wall of various straps, but no patellar tendinitis strap. Just as I decide to settle on an ace bandage, I notice an elbow strap that looks similar. I pull it off the wall and sure enough, it fits my knee. Now, I'm not exactly Kate Moss so I marvel that anyone's elbow can be as big as my knee. I ponder the question of obesity in America for at least 50 miles. But my left knee is very happy. 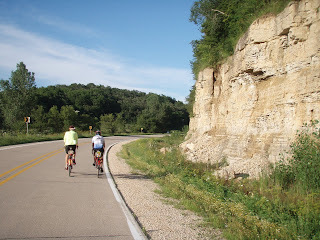 The climb out of Decorah on CR9 is about 3 miles long and for the first time all day, it feels hot. That tail wind is just not a friend when climbing. Finally we reach the top and turn onto W42 for the final 25 miles to West Union. This stretch is really quite pretty with wild flowers and some nice rural houses. I manage to drift off the road and and cross country for a few feet, losing my bottle and eliciting lots of laughs. We wind our way up and down until finally coming into West Union at mile 180. From here, we have an out-and-back to Elkader and est Union is the official overnight. We see Melissa at the control and she leaves Bob a key for the room. We will have a place to shower! The ride to Elkader is a fun one. We join up for the night with Ralph, who has been riding a couple minutes ahead of us for miles. I really enjoy this particular part of the ride. It's early evening and the sky is full of nice clouds. 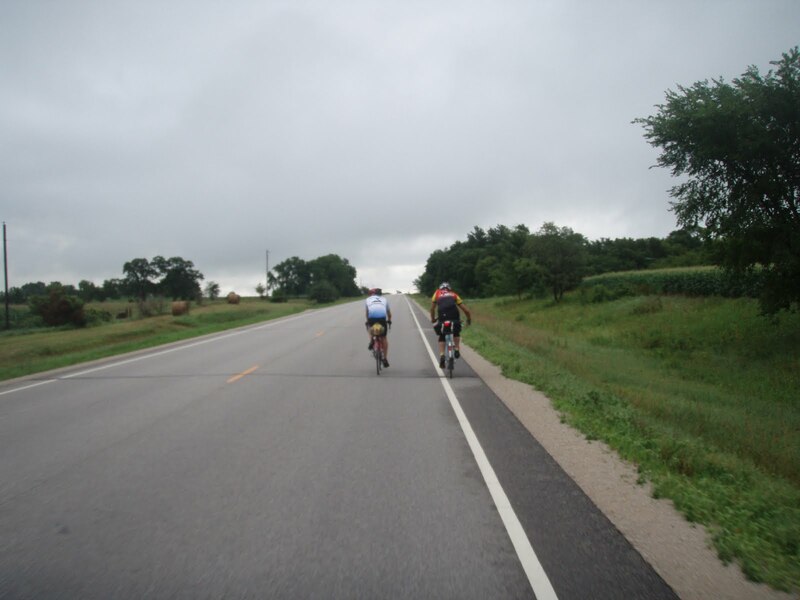 Just outside Elgin, we see Martin (#2) on his way back in. It's about 6:30 pm. 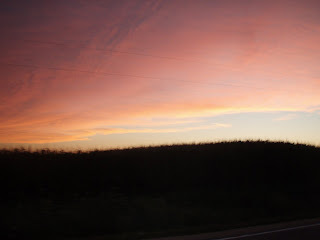 I take pictures and we cruise along to the control, the Cross Roads Convenience . Elkader sits at the bottom of a somewhat hilly valley. We see Kenny's wife there as well. Actually, it turns out we have seen her at every control, but I have just not really be with it enough to notice that the woman with the dog is the same one every time. Must be blood sugar, I think so I eat 2 servings of mashed potatoes, a can of V8, a bottle of chocolate milk and take Powerade for the road. The mashed potatoes taste fabulous, even the unidentified chewy parts! On the way back we are treated to a great sunset. It's about 9:00 pm and spirits are really good. I am looking forward to the night ride. We get back to West Union at about 10:30 and head for the ahotel. We spend an hour there showering, changing out gear and talking to Mike and Melissa. Mike vows that the next time I see him he will be "in shape", I laugh because even out of shape, he rides much faster than I ever will. We only have 165 miles left when we pull out of West Union at midnight. Up until now, Bob has theorized that my bad hamstring has been making us go faster than normal. Sound odd? His reasoning seems sound. Because I am forced to not push it up hills, we are riding at a more stable pace. Since we have for the most part stayed together, the theory is that no one tires on the hills and everyone is ready to get in a group and ride faster on the flatter sections. There are 4 of us now and as we leave West Union, which is a nice size for a night group (more lights=more visible=safer). We mistakenly think Kenny has stayed for a sleep in West Union when he actually is ahead of us. The moon is a waxing, gibbous one and the stars are out as well. The temperature hovers around 64 for most of the night. It's possible one of the best night rides I've ever done. At Decorah (400k), we stop at 2:30 am for food. It turns out this is a college town and bar close is at 2:00 so the streets are packed. The police are investigating goings on at the pizza place and there are 20 surly people hanging out at the Cenex station. Strangely, this turns out to be the only place we actually don't feel comfortable leaving the bikes alone. I eat well here, a sub, some Mountain Dew, and a cup of mandarin oranges. But I also only have to refill one of my bottles. This is the beginning of trouble, even though I didn't realize it at the time. 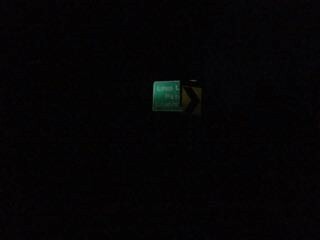 We pull out at 3:00 am, headed for Cresco, 20 miles away. There is a long climb out of Decorah and it goes slowly. I continue to climb slowly and the other's lights disappearing up the hill makes it seem a little more lonely. Paul goes ahead, but Bob hangs back. Ralph is getting tired and having stomach problems. It is the dead of night and I find myself sleepy. I take a caffeine pill to stay up. That makes my stomach not so happy as well. Our pace gets much slower. 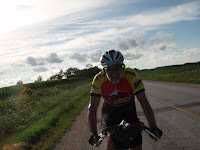 It's about 5:00 when we finally pull into Cresco (mile 270), passing an unidentified rider in the dark that turned out to be Kenny. At this point, I am approaching the time of day that I usually wake up (yes, I am an early bird). That's when I am the most tired and unintelligible. I tell Paul that I really need a nap and flop down, face first, onto the pavement. I am instantly asleep. Sleeping face-down on concrete in front of an all-night Kwik Trip is generally not seen; this turns out to be the best picture I didn't take for the ride. I at least got enough sleep to convince myself that I felt refreshed. I think the others napped as well. At this point, it's 5:30 am, the sun is up and Paul is anxious to leave. Here I make the biggest mistake of the day. I rush things. I don't eat hardly anything. I'm feeling cold from the concrete so I get a small cappuccino and a Starbucks double shot knock off. I haven't even finished a quarter of my fluids from Decorah. I should have taken 15 minutes, eaten a sandwich, drank more fluids, and fully woken up. As it was, aside from forgetting to eat and drink, I forgot to change GPS batteries, stretch (another huge error) and buy food for the next section. Note to self: self, print a laminated sheet of everything to do at a control and use it as a checklist when sleeping face-down on concrete. It was a really nice dawn as we rode out of town. 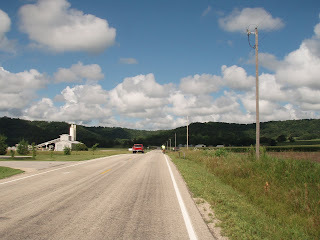 The lack of food and fluids for so long hit me in the 15 miles between Cresco and Harmony and I asked Bob to stop there even though it wasn't a control. Even so, by this time, I found myself unable to eat and rushing. I had gotten through half a bottle but was still fighting back sleep. The next 30 miles (of my least favorite stretch of road) were pretty un-enjoyable. I rode mainly alone with the others in the distance. I finally caught them in Highland where I silently wished I could stop at the cafe for a piece of pie. 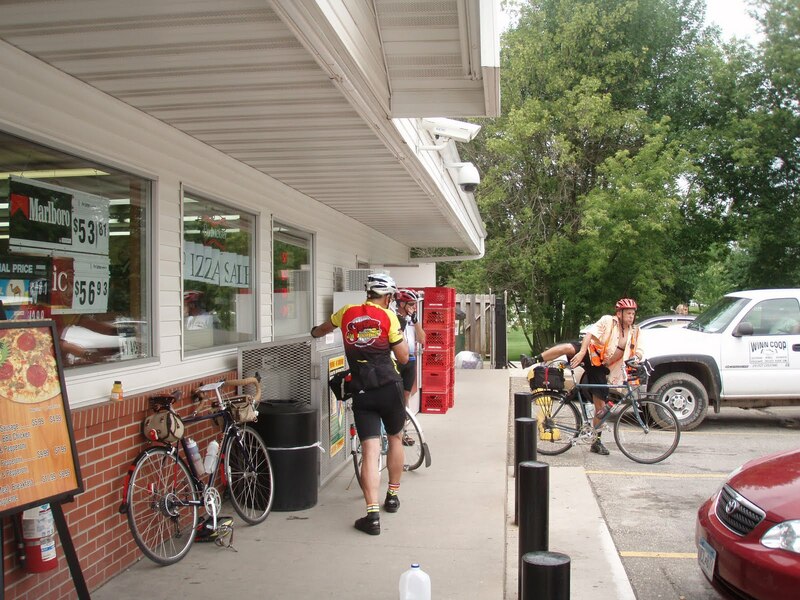 Instead, we rode the final 12 miles into Rushford. Another rider, not Martin, passed us. He had chosen to stop and sleep but not the full 8 hours. By this time, tired or not, I knew eating was critical and I forced myself to eat a small sub, a cup of fruit, a V8, and a chocolate milk. I should have pushed even more fluids, but I did start feeling better. We left at about 9:30 am with only about 70 miles to go. It had gotten hot and sitting out in the sun, the thermometer on my bike had soared to 113. The climb out of Rushford is a long, hard one. I did it alone again knowing the others were waiting at the top. I had a brief wave of nausea and finally settled into the climb. At the top, the others were waiting and calling spouses. I called Kathy only to find out she didn't feel well enough to come to the finish. Though I understood, it was still kind of tough to hear. 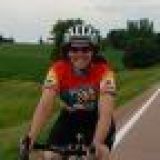 The next 20 miles to Chatfield, I started getting frustrated with my lack of sprinting and did some fast, hard pedaling. Fortunately, nothing too bad happened, but it wasn't wise. We made it to Chatfield (mile 330) at 12:15. My stomach was still unhappy and I drank a coke and had a banana. We had one major climb to go out of Chatfield and again, I slowly mustered up while the others got to the top and took a break. Nearly at the top, my knees were hurting badly and I finally got off the bike, cranked up my seat, took 6 endurolytes and took off as fast as I could. I waved at the others who got on their bikes and followed. For the next 7 miles I sprinted at between 22-24 mph, all the way to Stewartville. In retrospect, it was really not a very smart move. 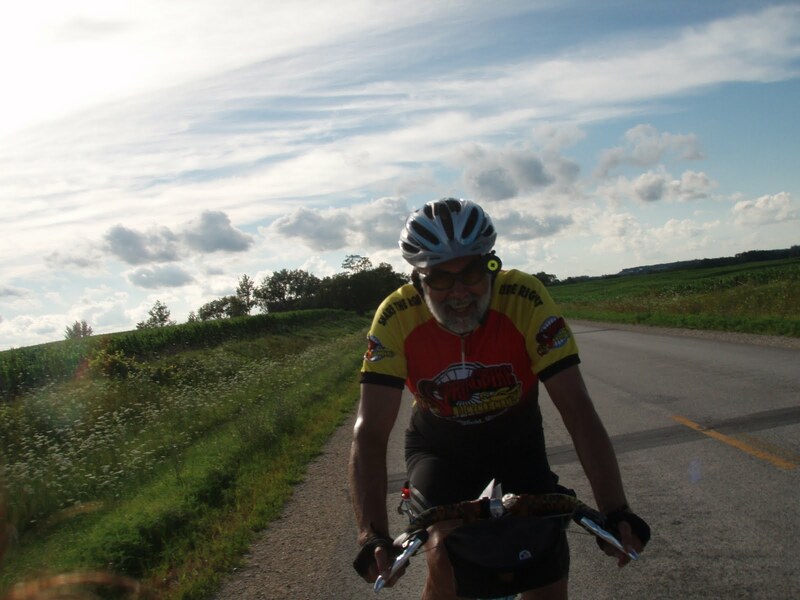 We pulled into Stewartville at about 2:00 pm, even with the big sprint it still took 1:15 to go 15 miles. I stared into the cooler and suddenly had an overwhelming desire to drink water. I bought a bottle (should have bought a whole gallon). Then Martin finally caught us. We chatted for awhile. He wasn't there for very long, but it was a sort of marker point in the ride. Only 30 miles to go. The next 20 miles had some tough pavement. Lots of cracks that seemed to be somehow much worse than last year. At this point, it manifested by making me a little cranky and paranoid. The other 2 finally went ahead and it was on the big rollers before the last control that my hamstring suddenly went boom. It was really hot and I was alone on a climb when I cramped severely in the side of my leg. Though it was not in exactly the same place as before, it was so painful that I couldn't really say where it was. Only 10 miles to go! I took 3 more endurolytes, realized I hadn't drunk hardly a thing for 10 miles and downed half a bottle of sports drink. Then I got back up, walked carefully to the top of the roller and realized it was all downhill to the control. I coasted down and rode one-legged into the gas station. The other two were there resting; it was very hot in the afternoon sun. I told Bob to just go on with Paul and that I needed to go at my own pace or just stop now; I was really worried that I had actually severed my hamstring. He and Paul convinced me to try and stretch it out. I had another coke and some chocolate milk, but they didn't have V8 unfortunately. I took the rest of my Endurolytes and tried to lay down and stretch. After about 5-10 minutes, the cramp began to subside. I told Bob and Paul that I was either going to get up and ride out, or the heat was going to start cooking me alive. So we got back on the bikes. Happily, there is about a 3 mile downhill outside Byron. There were a couple of climbs, but by the time we got there, the cramping had subsided enough so that I could definitely tell that it was my IT band and not my hamstring that was causing all the pain. That made me feel so much better, at least I was only mostly maimed. We finished at 5:08. 35 hours and 8 minutes from the start. At the finish were Melissa, Kenny, Paul's wife Karen, and some others. Mike had had some issues and stopped outside Rushford. I think 2 others were still out when we left. We changed quickly and Karen drove both of us back to the Twin Cities. I iced my knees because I promised my PT that I would, but my legs really felt very good once the cramp was gone. Looking back on it and comparing with my original ride and the Cascades, I realize just how much harder it is to ride through the night than it is to just take 4 hours off and sleep well at an overnight control. I am oddly more pleased with last year's ride since I had always wondered if I should have skipped what I thought was a useless sleep stop. Even though I didn't sleep, I still rested enough so that in terms of moving time, I rode a little faster last year than this year. I also think that spinning up hills slowly really made my overall pace faster. For me, I suspect it was because I was ready to take off at the top when normally I am wanting to take a break. A valuable lesson. As usual, this was a great ride because of the people I was with. It was great to ride with Paul again and I really hope that I see Ralph, Kenny and Bob on other rides in the future. 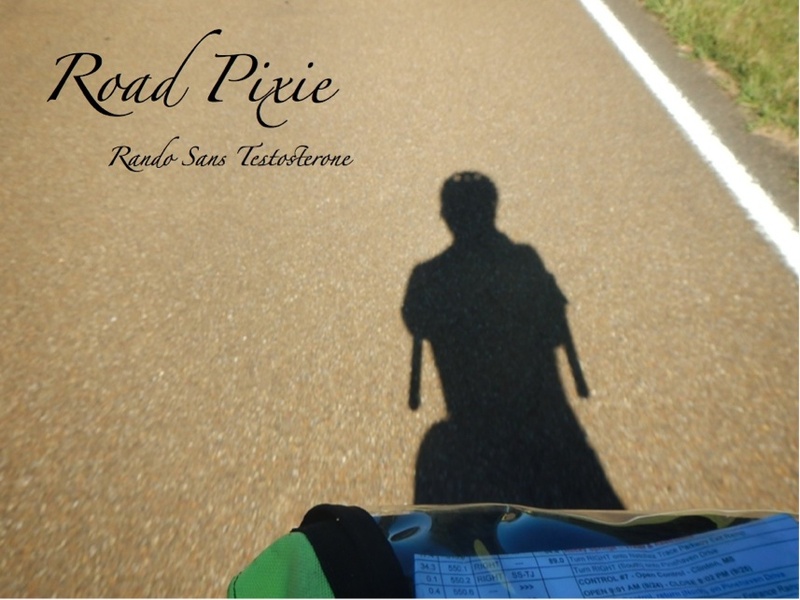 I hope I was at least an amusing sight (on the pavement and on the bike) so that they will want to ride with me again.